When it comes to dental care, pediatric dentist, Dr. Darren Tong and the Smile More Kidz team know that every patient we see at any age or stage of dental development is 100% unique, and their dental care plans should be too. That's why we take the time to get to know all of our young patients and their oral health and behavioral needs. We want to make sure your child develops great oral hygiene habits and a healthy smile, but most importantly, we want to make sure that visiting the dentist makes your child smile. We work hard to offer gentle treatment, answer your child’s questions, and develop positive associations with dental health for your child. More than half of those patients who experience dental phobia or anxiety as adults point to a negative experience in their youth as the cause of their discomfort. 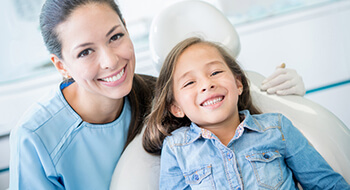 At our Tappan, NY children's dentistry practice, we go above and beyond to make sure your child feels safe and at ease during every procedure. From pain relieving treatments to complete sleep dentistry from our on-site dental anesthesiologist, Dr. Jonathan Medina, we do all we can to ensure your kids love visiting us as much as we love to see them smile. Children’s dentistry isn't just about treatments that cater to your child’s stage of dental development. It's about care that makes kids learn to love caring for their smiles and visiting our office. If you're looking for a children's dentistry practice serving patients from Tappan, NY and surrounding communities, contact our team to find out more or schedule an appointment.